The Botanical Garden was established in 1921. It has been part of the memory of Taipei citizens. Many people come here to appreciate the lotus in summer and falling leaves in winter. 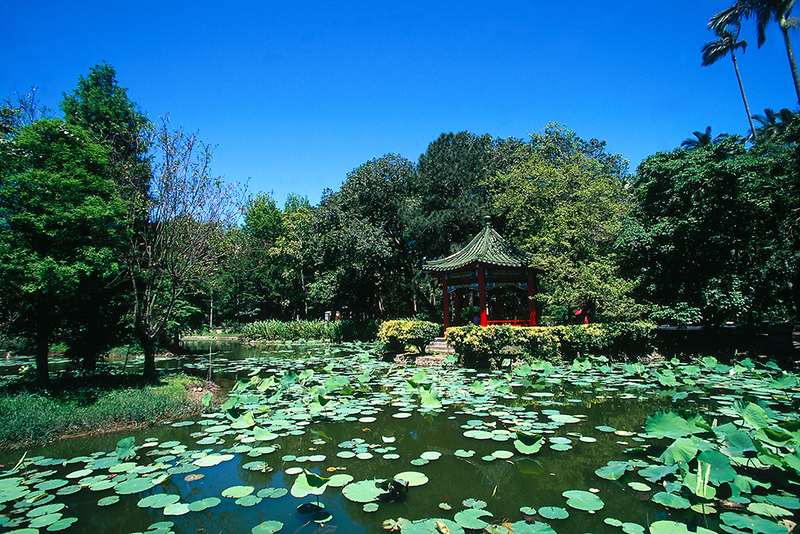 The Botanical Garden was established on January 22, 1921. In 1930, there were 1129 species in the garden, serving greatly to academic research and natural science. However, the garden was deserted during World War II. After the war, the garden was rearranged and new plants were introduced. Currently, the garden is well maintained and has over 100 species of plants. There are 17 districts in the garden, exhibiting various plants. The 9 ponds are also designed to grow different plants. As green land is far and scarce in urban area, the garden has become a popular leisure space for Taipei citizens. The garden is next to National History Museum, Science Museum and Art Museum. Nat'l Hwy 1 → Exit to Taipei Interchange → Sec. 3 to 1, Chongqing N. Rd. → Sec. 1 to 2, Chongqing S. Rd. → Nanhai Rd. Take the THSR or train to Taipei Station, transfer Taipei MRT to Chiang Kai-shek Memorial Hall Station.